In a packed auditorium on the Saturday before International Women’s Day (IWD), Judy Vashti Persad, a member of the IWD organizing committee, let out a rallying cry to the hundreds who had gathered to kick off the festivities with a city wide march. “Let us go onto the streets knowing our power, knowing the history of our footsteps and make history as we march together,” she said. Persad stressed the importance of recognizing that IWD is “a day for all women,” including First Nations women, trans women, women of colour and students. 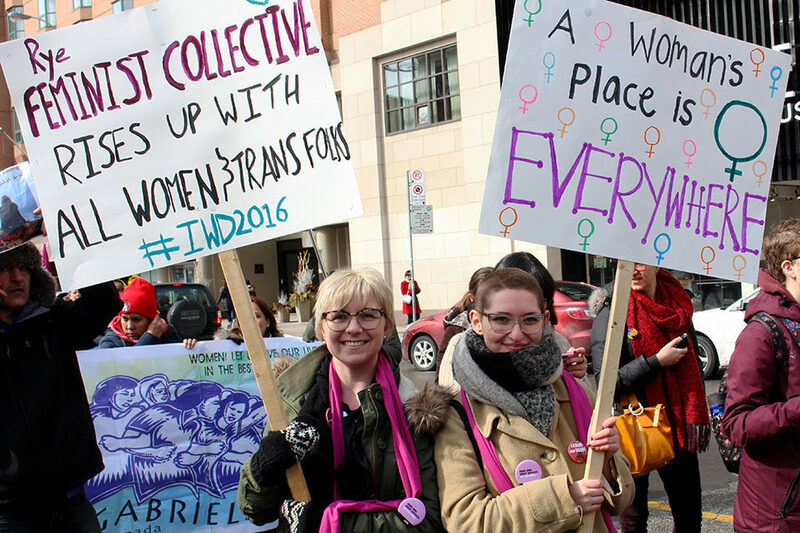 The event, which was co-hosted by Ryerson’s Centre for Women and Trans People (CWTP), began with powerful talks from keynote speakers demanding equality for all women. After the talks, participants began their march to Ryerson. The theme for this year’s event was “All Women Rise Up,” a powerful call to arms for all women to inspire solidarity in furthering intersectional feminism. Intersectional feminism acknowledges the varying forms of oppression women face, such as racism, homophobia, transphobia and ableism. It says that feminism should include the fight against all of these forms of oppression. Alyson Rodgers, a fourth-year social work student and co-founder of Ryerson’s Feminist Collective, was enthusiastic about the event, highlighting the diverse range of issues that affect women in Canada. “It’s about really emphasizing an intersectional lens to looking at women’s issues and what that looks like for all women and not just white women,” Rodgers said. For Ikram Hassan, a member of both Ryerson’s CWTP and the Muslim Students’ Association, this is a welcome shift. “For me, looking back 10, even 15 years ago, women of colour, indigenous women, black women – they weren’t at the centre of the conversation. They were at the margins of everything, but now I see more women pushing to include them,” Hassan said. Coun. Kristyn Wong-Tam, who marched in the rally’s front lines, said that the fight for women’s rights doesn’t end when the march reaches Gould Street.